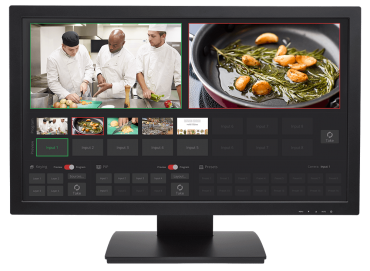 The TeleTouch 27" USB Touch-Screen Multiviewer works in conjunction with the AV Bridge MatrixMIX switcher for an intuitive control interface that is perfect for both occasional and everyday users. 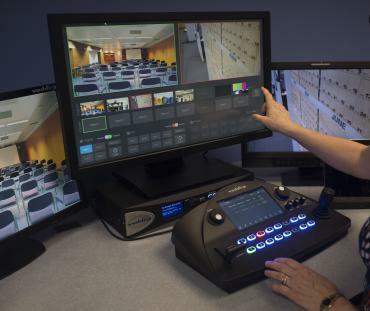 The screen's capacitive touch creates an interactive surface for the AV Bridge MatrixMIX's multiview output - for simple preset recall, video switching and graphics keying. 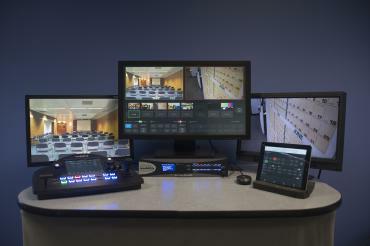 Built-in speakers allow the operator to have a customizable audio mix from the switcher. The LED back-lit monitor and full-color LCD panel display ensure superior image quality. The industrial-grade surface is smudge-resistant, durable and easy to clean. The TeleTouch 27" USB Touch-Screen comes with a base stand that allows up to 90 degrees tilt, and can also be easily connected to mounting options that fit 100 x 100 or 200 x 100 VESA patterns. Please note: The TeleTouch 27" Multiviewer is not compatible with ProductionVIEW Switchers.